DURHAM: Jennifer Jones died Sunday, December 2, 2018. She was the daughter of Sam and Urai Jones. 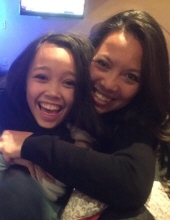 In addition to her parents, Ms. Jones is survived by her daughter, Aliyah Sprague-Jones; and sister, Susan Nguyen. She was preceded in death by her sister, May Wong. Jenny was loved by everyone she came across. She never met a stranger; instead she always made a new friend. She loved to travel, most of all, she loved the beach. Her daughter, Aliyah was the light and love of her life. Not only was she a mother to Aliyah, but she was her best friend as well. She was a second mother to all of Aliyah’s friends who called her home their home. She loved each of them as if they were her own. Jenny was an avid 80’s child, always listening and singing to 80’s music and sporting 80’s apparel. Jenny was an animal lover, and always supported the “Adopt Don’t Shop” campaign, hence, the four dogs of her own, Watson, Bella, Umi and Debo. The family would like to particularly thank the Duke Eye Center of Cary team and the #goodjuju4jenny Army for all of their unbelievable support and love. In lieu of flowers, memorial contributions can be made for Aliyah’s college tuition. Please see Jane Liertz, Bill Drew, Sam and Urai Jones, or Chris Spraque for details. A Celebration of Life will be held at 1:00 p.m. on Saturday, December 15 at Greystone Church. Casual attire is preferred. To send flowers or a remembrance gift to the family of Jennifer Jones, please visit our Tribute Store. "Email Address" would like to share the life celebration of Jennifer Jones. Click on the "link" to go to share a favorite memory or leave a condolence message for the family.